Huda Beauty Faux Filter Foundation - Worth the Hype? Huda Beauty is stocked on Cult Beauty for those in the UK, so aside from the shades quickly selling out I had no issues with the order. Cult Beauty delivery is always pretty quick and costs around £4 or if you spend over £40 it's free which is pretty reasonable. The foundation itself is £32 which actually surprised me, considering her large palettes will set you back £56! For a good high end foundation I think the price point is good. The bottle is plastic and I've heard people complaining about this, I can see why, most foundations of this price bracket would be in a glass bottle. I don't actually mind the plastic bottle though. It makes it ideal for travelling and no risk of breaking it. It also comes with a pump which is always a plus. For me it's all about if the product actually works. I can forgive bad packaging and expensive shipping if the product is amazing! First of all this comes in a huge 30 Shades, catering to most skin tones which is really good. I have the shade Balava 340G which is a tad too dark for me, I should have a shade or too lighter. But with lots of fake tan it's fine. This does claim to be a blurring, full coverage foundation, that is super long wearing. And this is actually blurring, it makes the skin look perfected and flawless. Now it won't look as good as your favourite Instagram filter but it will look a lot better. It has a satin finish to really make it easy to matte down more or make more dewy, The coverage is full and does cover all my problems with ease! The consistency is quite thick but still creamy. I find the best way to apply this is with a dense brush as opposed to the Beauty Blender! When blending it almost doesn't want to move on the skin, but it's not hard to blend though. It's difficult to explain! But I find patting it in with a brush is the best way. I actually need to buy the matching brush to go with it. In terms of wear time I did find this wore off my chin quite quickly but its really easy to touch in and maintain. The finish is so good I can get past the wear time. On the rest of my face though it's doesn't budge. Makeup applies really well over the top and it sits really well on my dehydrated skin without drying out or going caky. The important question! Yes I think this is! I can see why the beauty world has gone crazy for this and if you're looking for your favourite Instagram filter in a bottle this is the closest I've found. 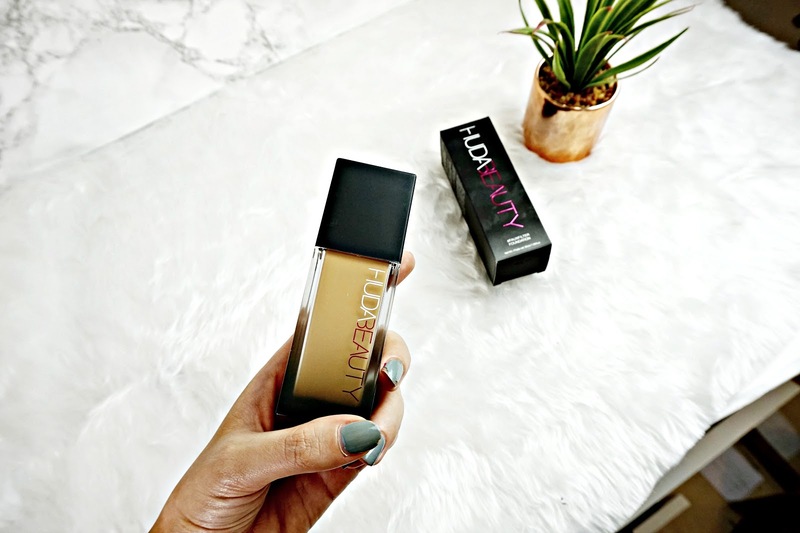 The Huda Beauty Faux Filter Foundation is available from Cult Beauty here.